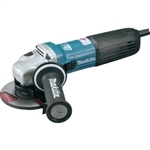 Save on shipping with our 5 Gallon Ship Saver: 4 - 1.25 Gallon Cans The Makita 4-1/2" SJSII High Power Angle Grinder (GA4542C) combines power, convenience, comfort and motor-protection features for longer-lasting industrial performance. It is ideal for cutting, grinding ferrous metal, paint and rust removal, shipyard maintenance, metal polishing, general steel grinding, auto repair work, cutting brick and masonry, restoration work and more. Warning: For all Abaco lifting products, follow the manufacturer's specifications for minimum slab size and Working Load Capacity when choosing the appropriate lifter. When using an Abaco lifting product, follow all safety instructions and processes found in the product's manual. blade that will meet the challenges of cutting modern building products.